Moborobo is the perfect products to manage and control your device through your PC no matter its android or iOS devices. Although being a pioneer brand in the software and application market, for a long time Android was lagging behind of iOS and Windows in launching their own official desktop management tools center. This obstacle was successfully covered by the launch of an application called Moborobo. For long, Android did not have an official desktop application of its own and there were other software applications available at that time such as iTunes and Zune. But many users found the app to be a bit bloated. Moborobo presented itself as a safe and easy alternative for both Android and iOS users. Moborobo allows smartphone operators and vendors to have complete control on their file system and phones data. Users can view, download and install various applications to their Android device through a PC connection which itself gives them a speed advantage over normal mobile download-and-install process, and most importantly, Moborobo saves your precious mobile phone data usage. Additionally everything, from viewing images and videos to downloading applications and software’s can be done with great ease and unmatched pace. And not just software control, users also have the benefit of receiving and reading messages on their PC itself. Also, all images, videos, music’s and apps can be controlled and modified by users themselves. So a mere PC connection is enough to manage and update anything on your smartphone or android device. 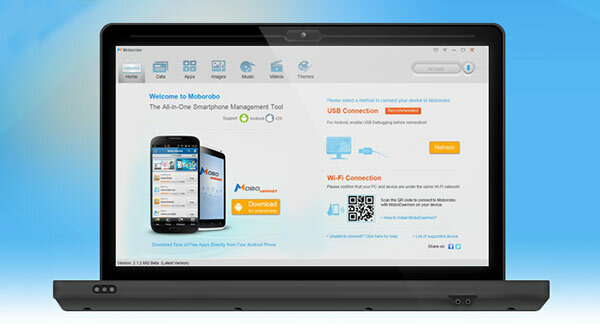 As everything can be handled from PC’s internet connection itself, Moborobo gives its user the advantage of preserving their smartphones internet data pack. This can be alternative interpreted as having to spend nothing at all to download and install apps and games to your android device. It turns out highly beneficial for users facing expensive 3G tariff charges. Several features of the application are quite useful for both customers as well as smartphone vendors. For example Moborobo’s batch-type feature allows buyers to download their own customized batch of favorite apps. Likewise, smartphone vendors can use a batch of default apps to be installed into an Android product. Furthermore, options such as “Phone clean-up” is provided which cleans your mobiles cache memory so as to improve its processing speed and performance. This fascinating application has an in-built app and resource download center as well. With its help, users can have access to a vast range of resource that includes almost all kinds of data category. Let it be games or ringtones, wallpapers or themes, the download center has got it all. And as mentioned before, downloading charges are not included in the phone’s data pack as the application’s desktop interface interacts with PC alone, not with the phone. So all that remains to be done is to install the downloaded file from the Mobo Library folder and on to your Android device. Moreover, users can set interests for a particular genre of apps and Moborobo will keep them updated and recommend new apps that have entered the market. Fully integrated app manager allows users to claim complete control over updates and downloads. 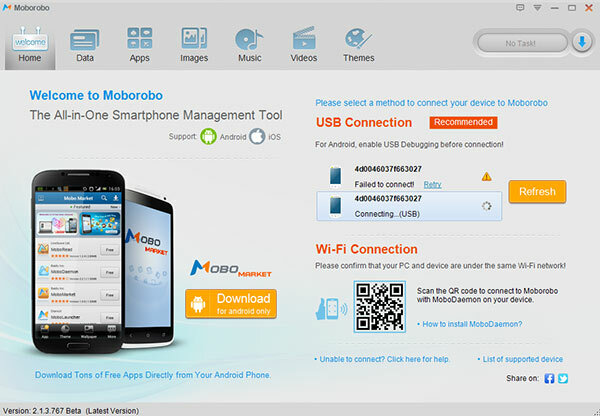 Also, installation and removal tasks can be performed with Moborobo itself. Moborobo also comes with its own official App Market application called the Mobo Market. This one-stop app store provides a very good alternative to Google Play Market and. With a wide range of resource and useful features available, this app market lets its users to do quite a lot of stuffs. Just as its slogan said, – “Discover your next favorite App”. Not just to be used as a downloader and installer of apps and games, Mobo Market can also function as a medium to have access to unlimited wallpapers, images, themes and more. There are two methods of link available for users to connect to Moborobo. One is by regular USB port connection while the other is by making use of Wi-Fi. All android versions above 1.5 are supported by Moborobo. Once connected, the first launch screen of the application shows the details of device connected to the PC. Deamon must be necessarily included in your smartphone to establish a connection with either a desktop or a laptop. Moreover, users must remember to enable USB debugging on their android device prior to usage. Conclusively, Moborobo offers its users a perfect platform to handle and arrange their own set of customized apps and resources. With such a viable application, users of both iOS and Android are equally benefited as downloading/installing apps and file management have become a very simple task. You can connect with their team on Facebook and Twitter.